Home » Posts Tagged "Denning"
Mark Desetti, Director of Government Relations with Marcus Baltzell, Director of Communications. 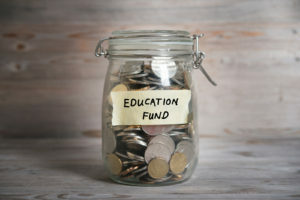 Conservatives who demanded that the Legislature take no action on school finance until a new cost study was available – a study conducted under their parameters by a consultant that they chose – are now trying to distance themselves from that study and discredit it. And so, over the objections of the Democrats, Republican House and Senate Leadership approved hundreds of thousands of dollars to hire two attorneys and a consultant to conduct a new cost study. They chose a consultant, Dr. Lori Taylor of Texas A&M University, to conduct the study and Senate President Susan Wagle (R-Wichita) told the Wichita Eagle that they had hired a consultant to demonstrate that the state was adequately funding schools. “We’re focused on finding experts who can help show the court that funding is adequate,” Susan Wagle, R-Wichita (Wichita Eagle, Feb. 23, 2018). Senate Majority Leader Jim Denning, R-Overland Park, also rejected the idea that the results of the study were predetermined. 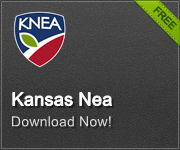 Denning said the estimates that Kansas needs to add upwards of $600 million to its education budget are largely based on cost estimates done in 2002 and 2003, during an earlier school finance lawsuit, with those figures simply updated for inflation. Today, though, Denning was leading the attack to reject or discredit the report. He challenged it on the performance thresholds that were being used, suggesting that use of the approved state ESSA (Every Student Succeeds Act) plan was not appropriate. In other words, if we lower our performance goals, we could lower the cost of education. Denning even went so far at one point as to refer to the study as “simply an academic exercise, not a financial one.” Still, it was an “academic exercise” that Denning was hanging his hat on earlier as a way to block increases in education funding. Conservatives have for years been swayed by the rhetoric of Dave Trabert and the Kansas Policy Institute. In fact, if the state had a dollar for every time Trabert said “money doesn’t matter” or “schools are terribly inefficient,” there might have been enough money in the treasury to pay for this study. The report still needs to be fully digested by legislators. We can expect that talks will begin soon about how best to address the Gannon decision in light of this new report. Conservatives might also renew their calls for constitutional amendments either limiting the state’s responsibility for education funding or stripping the Supreme Court of the authority to act. Since the consultants also suggest a longer timeline for phasing funding in, cooler heads will likely begin to discuss how long that might be as well as how to lock in increases over time even as membership in the legislature changes. It is often noted that today’s legislative decisions are not binding on future legislatures. The study will give conservatives more to complain about but might also give Democrats and Moderates just the boost they need to put together a coalition plan to meet the Gannon ruling. But no matter what, they need to get cracking! Briefs are due to the Supreme Court on April 30! Senate puts out rescission bill after all; no school funding cuts… yet. The Senate Ways and Means Committee this morning tentatively approved its rescission bill intended to solve the 2017 budget hole. They plan to move the bill out to the full Senate tomorrow. A vote on the floor is expected on Wednesday or more likely Thursday of this week. The bill does not contain a 2% cut to education as was rumored. 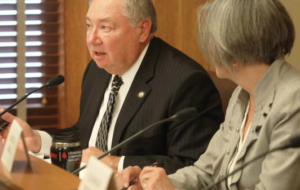 However, Senator Jim Denning (R-Overland Park) has indicated in press reports that he fully expects there to be an attempt to amend cuts into the bill once it gets to the floor for debate. 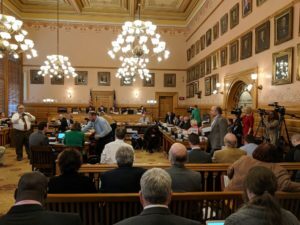 The House plan to get out of the 2017 mess created by the reckless Brownback tax cuts would delay a KPERS payment this year and not repay the lost payment from last year. In addition, it would borrow $317 million from the pooled money investment board (PMIB) and repay that loan over seven years. The Senate version would repay the KPERS money taken from last year and take another $150 million this year to be paid back over 20 years. It would also borrow about $100 million from the PMIB instead of the full $317 million in the House plan. Of course, any repayment plans depend on both chambers passing a comprehensive tax reform package that ends the Brownback experiment. NOW IS THE TIME to tell your Senator to vote NO on any amendment that would cut school funding. Today the House education budget committee began to piece together ideas for a new school funding formula. In an interesting twist, Chairman Larry Campbell (R-Olathe) turned over the Committee to Rep. Clay Aurand (R-Belleville) to handle the discussion. In the early discussions, it would appear that the new formula would be very similar to the old formula and based perhaps on the ideas in HB 2270 (the Rooker bill) and HB 2324 (the Trimmer bill). There was consensus that they would not use the census based at-risk funding proposal but might go with a blend of poverty and “direct certification” (students certified by DCF for services). There was no consensus on a non-proficient at-risk weighting. Bilingual weighting was discussed and there seemed to be some interest in another blend – basing funding on contact hours with certified bilingual staff and an FTE headcount. On CTE weighting, there is significant interest in looking at actual costs of individual programs and funding them accordingly. At the end of the meeting today, Aurand brought up one of his old ideas (one that has never passed). Ever since the Montoy decision, Aurand has been proposing that the state “take credit” for more funding by calling a large portion of locally raised LOB money “foundation funding” and requiring it to be levied. Aurand told the committee he wanted this proposal in the bill.